The demolition process is a complex one that requires an experienced team. But, also, the team needs to be familiar with obtaining a demolition permit, and the policies and laws that need to be adhered to. Kloos Hauling and Demolition can be your experienced team, creating a safe job site, following laws in accordance with demolition legalities in Winnipeg, Manitoba, Canada. There are many things to consider in the demolition of a building or structure. A demolition permit is required depending on the building that is to be demolished. The Inspections Branch will be the governing body that will determine how the structure should be dealt with and what risk may be involved with the property itself and neighbouring properties. This is what the Inspections Branch refers to as the pre-issuing period. Within the period, they will tour the property to learn about things like, gas lines, phone lines, water and waste, and other structural considerations. A permit is required when the structure measures 10m2/108 square feet. The structure resides less than 8-feet from another building’s foundation. Only partial demolition is needed, and part of the old structure will be reused to rebuild. When full demolition is required with or without plans for future rebuilding. Perimeter fencing is required around the project site as well to ensure the safety of others. For more information on demolition permits for the City of Winnipeg – visit: https://winnipeg.ca/ppd/permits/Residential/Demolitions.stm. The website has detailed information and links to demolition permit application forms. Demolition permit holders are required to contact utility management companies to ensure all lines running to the property are secured or removed before the demolition takes place. Once the demolition permit is issued, the permit holder has 30 days to perform the demolition work. The work needs to be completed within a 30-day period through a qualified company. Kloos Hauling and Demolition is your demolition team – it’s in our name! Management of demolition projects can be multi-layered. We suggest working with a team that comes with the experience necessary to ensure a safe and smooth project. 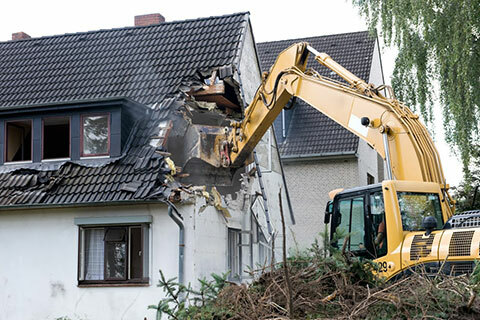 We understand this process thoroughly and work with both residential demolition and commercial demolition clients from start to finish. If you have any questions about the demolition process, we urge you to contact us today – 204.955.1188 – and make it a Kloos call! Posted in Blog and tagged Commercial Demolition, Debris Removal, Demolition, Garage Demolition, Residential Demolition. ← What are garage clean-up services?